During the 10 a.m. worship service, children aged six-weeks to 3 years old are welcome in the nursery that is staffed by two trained child-care providers. The nursery is located just off of the Assembly Hall with easy access from the Church or the Assembly Hall. Parents are welcome to use the Nursery to enhance their own worship experience. Some parents prefer to have their children with them throughout the entire worship service. 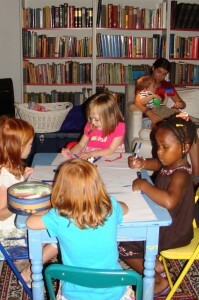 Nursery care is also available during other selected special events. We try to accommodate families in every way possible. If you would like nursery care at a particular event, please contact the Parish Office to see if it can be arranged.